Michael Duhon is an artist who combines his expertise in both architecture and cooking, taking his students and clients to new culinary and artistic heights. He has worked for thirty years as an interior architect. Nearly fifteen years ago he decided to pursue his other great passion, cooking. He is a graduate of University of Louisiana in Interior Architecture, The School of Natural Cookery, Boulder, Colorado, École Grégoire-Ferrandi, Paris, France , La Escuela de Hosteleria y Turismo, Valencia, Spain, and Heartwood Institute's Asian Healing Arts in Garberville, California. Blending culinary and architectural forms in an artistic expression is a synthesis that comes naturally. "Well designed space and well designed dishes involve similar design components such as form, color, texture and visual rhythm. Of course, in cooking, we add depth and variety of flavor." In 1978, Michael’s first commission was to design a rural residence. He worked with contemporary forms using materials common to the countryside to root the distinct structure to it’s environment. Integrated into the design were responses to environmental factors such as wind directions, summer and winter sun angles. This use of passive green design was augmented with solar heating panels. This formative project provided early experience, visible in his work today, in the interplay of form, function, texture, lighting, proportion, and spatial emotion. Following that project he worked as a designer in 4 architectural firms. During the last decade he has worked independently. Primarily working from a “small space, high use” point of view, he designs and builds projects through a network of client referrals across the country,. 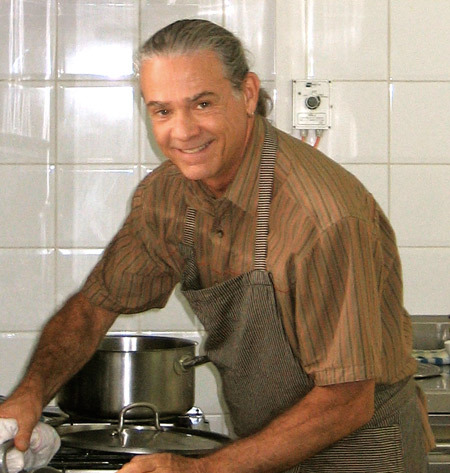 In 1996 Michael began teaching creative cooking using whole, plant based ingredients to the home cook. From 2001 to 2012 he worked with The School of Natural Cookery as one of it’s core chef instructors where he taught dessert fundamentals, gastronomy and performance dinner to aspiring vegan and vegetarian chefs. Michael accepts work invitations as a guest chef for events locally and abroad. He is also involved in catering for small group events and celebrations.